I’ve been playing (and watching) alot of soccer recently with the kids and it got me thinking about how hard the pros can kick the ball compared to us. This got me thinking about how much energy athletes can impart to a soccer ball and how that compares to balls and projectiles in other sports. This is not a scientific study, as I just googled the fastest pitch, shot, serve, kick, throw etc. from a variety of sports and the weight of the respective balls/projectiles to calculate their kinetic energy and momentum. 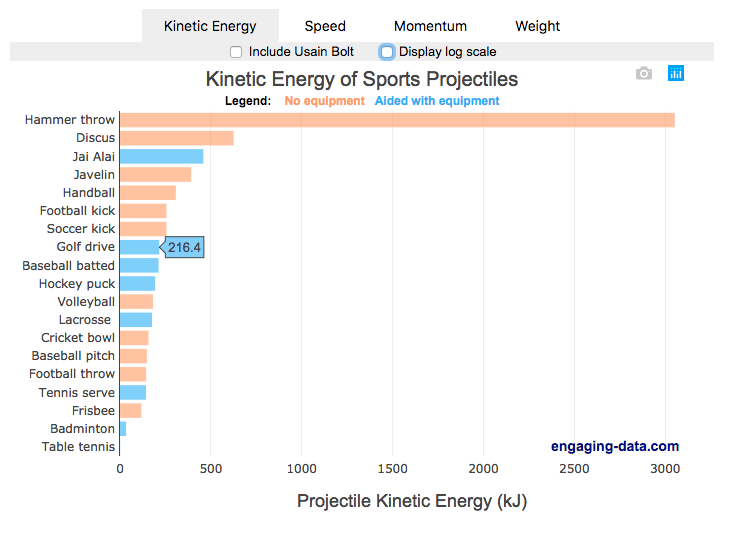 I added in the stats for a (sort of) human projectile for comparison as well (Usain Bolt). The graph is color coded so orange refers to projectiles that require no additional equipment, while the blue requires a bat or racket or club to aid in hitting the ball. You can toggle between log and linear scale on the x-axis to better see the differences between different projectiles. The hammer throw is interesting because it far exceeds the kinetic energy and momentum of the other balls. If you watch a video of olympic hammer throws, you’ll see how much energy these very large, strong athletes are able to put into the throw. I think another aspect is that the top kinetic energy projectiles are all throws where there is significant acceleration of the projectile over a longer period of time rather than an instantaneous kick or hit. Switching to the speed tab, all of the fastest projectiles are aided by equipment to achieve their very high speeds, but generally these projectiles have lower weights. This is also seen in the momentum tab, where the heavier projectiles are mostly unaided by equipment, probably because of the challenge of imparting enough momentum onto a heavy ball/projectile would require accelerating an even heavier racket/bat. where E is kinetic energy (expressed in joules or kilojoules), m is mass and v is velocity (or speed). The equation for momentum is \(P = mv\), where P is momentum. The difference between momentum and kinetic energy is slightly tricky. The momentum rankings seem to prioritize the mass of the projectile while kinetic energy is a balance between speed (velocity) and mass. In kicking, throwing or hitting a ball/projectile, the player needs to put impart the energy into the ball. In a collision, total momentum of the system (player and ball) is conserved but kinetic energy is not, although total energy is (some energy may be “lost” as heat, sound, etc). In terms of being “hit” by the projectile, I believe that kinetic energy is probably more important than momentum for gauging the overall effect of the impact, but the total energy is not the only concern.The area over which the impact would occur is also important. Honestly, the table tennis (ping-pong) ball is the only one I think I’d be okay getting hit by (at least at these world record speeds). Here is the 2nd update of the original graphs that I made of Bryce Love’s rushing awesomeness. Bryce Love is still in a different league from all other running backs in the college football (and now has almost 300 yards more than his next closest competitor, and more than twice as many rushing yards as Saquon Barkley of Penn State). I am updating the original graphs that I made of Bryce Love’s rushing awesomeness. Bryce Love is still in a different league from all other running backs in the college football (about 250 yards more than his next closest competitor). Updates: I’ve updated the graphs with the latest data here. The latest visualization is focused on college football, not because there’s not enough articles written about college football (there are), but because there’s lots of interesting data out there and I’m still working on developing my visualization skills.